Free in the Kindle Store Three Days Only! Looking for a little mental and spiritual refreshment during your hectic day? 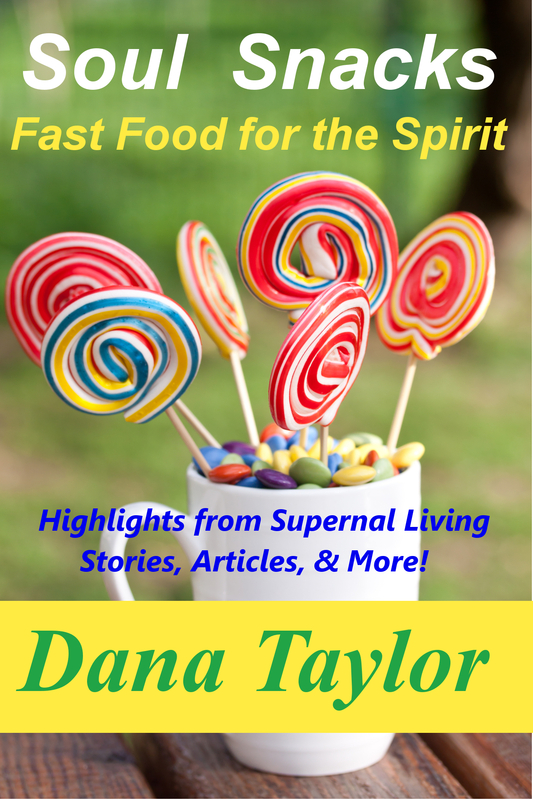 Soul Snacks: Fast Food for the Spirit brings you a variety of short stories, articles, reviews, and excerpts to give you a lift. Part One, Supernal Tales, offers four short stories with a mystical touch. The word “Supernal” is defined as “being or coming from on high,” Heavenly or Ethereal. You’ll enjoy four fictional stories of people who have their lives touched by supernal forces. House Call—inspired by my work as a Reiki therapist. A chronically ill woman spends the day with a unique therapist. Detour—A grieving young mother takes a drive that changes her life. The Lamp—Could it be a sign to this widower? Shiny Green Shoes—Life was hard on old Route 66 in Luther, Oklahoma during the Great Depression. A town down on its luck is given hope through the unlikely friendship of an aging actress and a poor child of the South. Part Two, Definitely Dana, includes popular blog posts from my personal experiences. Part Three, Reiki Healing Energy presents an introduction to the healing technique from Japan. Part Four, Supernal Book Reviews, are reviews of some of my favorite spiritual books. Part Five, Supernal Excerpts, gives you samples of some of my full-length fictional tales. Soul Snacks is available through the Kindle Store at Amazon. It is FREE for Kindle Unlimited Subscribers.